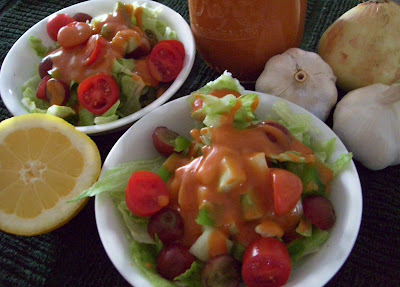 French dressing is a common and taste-friendly dressing...not too heavy, kind of tangy and a little sweet. It has a pretty color and its slightly thick consistency helps it cling to salad greens; an all around tasty addition to many meals. Everyone in my family has always liked it. French dressing, just like the common French fry, did not exactly get its start in France. The French fry, for instance became known to Americans throughThomas Jefferson who spent years in France as the Minister for our fledgling government. Jefferson loved his experiences there and, upon his return to America, brought the recipe for potatoes that he said were fried in the French manner. While it is not clear if he meant the cooking method or the julienned style of cutting them, Jefferson clearly failed to mention was that this type of potato had been invented in Belgium. The familiar tomato-based mixture we call French dressing, on the other hand, actually became popular in England and the US during the 20th century...there is nothing French about it. People in France do have a French dressing, but it is a vinaigrette...oil and vinegar...enhanced with herbs and spices. They have been making it that way since the 1880s. Note: as there are no preservatives in the dressing, use within a week or two. Measure all ingredients into a food processor or Vita Mix. Pulse until well blended and use immediately or refrigerate. For fruit salad, use more lemon and less vinegar.